Hometown and University: This is actually a tough question, but let’s say I hail from Memphis, TN. I studied English literature and creative writing at Agnes Scott College in Decatur, GA.
Fulbright ETA placement location and year: I was an ETA in Palembang, South Sumatra, for the 2013-2014 term. Current City and Job: I’m still knocking ‘round Palembang and work as an English teacher for Magenta-Fortrust, a franchise language school, and SMP Pusri. I also am a freelance writer with work published or upcoming in The Hairpin, The Toast, The Font, and Pink Pangea, among others. When I told people I was going to Indonesia, quite a few screwed up their faces and hesitantly asked me where that was. Really, more people know about Bali; not so many know that Bali is part of a country called Indonesia. I receive Google news alerts for Indonesia, and you could play a pretty brutal drinking game with what words tend to pop up the most in English-language news items about Indonesia: terrorism, trafficking (both drug and human), volcano, tsunami, poverty, Muslim extremism, paradise, environmental destruction, beach. No wonder Americans, if they know anything about Indonesia, seem to be only able to see it in two ways: a poor country ridden with natural disasters and Muslim terrorists or a tropical oasis where tourists can relax and get in touch with their inner peace or something, when in reality, Indonesia contains multitudes and transcends such simplistic categorization. My time in this country has been practice in straddling that in-between, trying to build bridges, and while a big part of that is teaching (just being in the classroom scrambles my students’ understanding of what an American is — turns out not all Americans are blonde and blue-eyed! ), I’ve discovered, as time goes on, that writing about and publishing my observations and experiences is the most meaningful and satisfying way to me of trying to get more people to scratch beneath the stereotypes. After all, I majored in English with a concentration in creative writing and have always intended to write professionally and publish fiction and nonfiction. Being in Indonesia has simply tightened and focused my writing about the topics I’ve always been interested in: race, gender, beauty standards, representation in media and pop culture, among others. 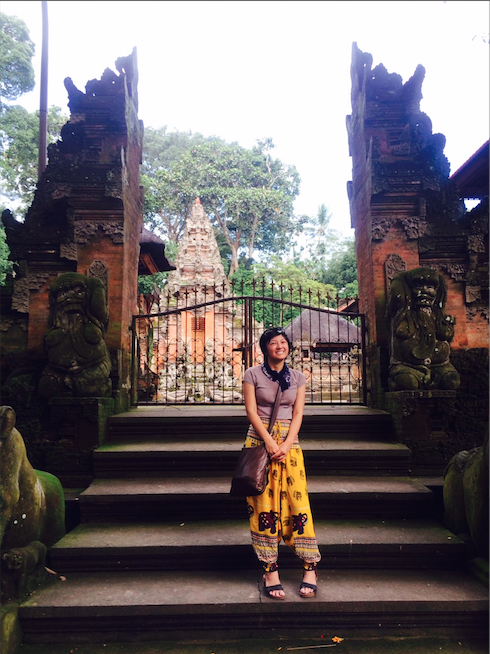 I actually started off writing for Indonesiaful during my grant, and when I returned to Indonesia last September to take a teaching job, I began to pitch to other publications. I was lucky to find a regular gig as a foreign correspondent for Pink Pangea, a women’s travel website, thanks to a lead from another former ETA, and so far, I love that the editors there have allowed me to follow my own peculiar whims, less “Here’s yet another piece about yoga/temple/beach/rice paddy,” and more “Here’s a piece about people living with the haze in Kalimantan and Sumatra or teaching my students about Halloween or observing qurban during Idhul Adha.” While my publications are not all about Indonesia, my experiences with intercultural engagement here and in America have definitely deepened my thinking and writing on a whole assortment of topics. As for the future? In the fall, I will be entering a master of fine arts program in fiction at Indiana University—Bloomington. It’s a program with a reputation in the field for commitment to underrepresented voices (despite the state government of Indiana currently being — not like that), and I hope to continue tearing down the lazy stereotypes that dominate English-language writing about Asia: no more “inscrutable” brown people, no more gauzy visions of palm trees and coffee plantations, no more brushing a whole country, a whole continent, a whole group of people with the same shallow layer of paint. I credit this fire in the gut with the opportunity provided by the Fulbright Commission/AMINEF to come here and fine-tune my passions and understanding. While the most obvious post-grant paths are development and education, if current and future ETAs have an artistic bent, creating works of art, whether writing, performance, or visual art, is a legitimate way of capitalizing on your experiences. The appallingly limited narrative about places like Indonesia needs to be challenged, and what better way than by creating books, games, comics, films, art, music, television, and plays? Change people’s thinking; change their actions. While I’m pretty early on in my writing career, I think more of us Fulbrighters, then, with our experience in this kind of cross-cultural engagement flooding the arts, popular culture, media and literati can only be a good thing.